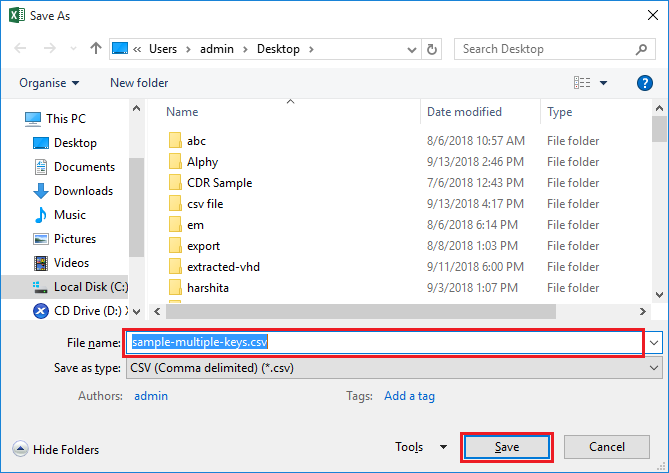 How to Remove Encryption fom Outlook Email Message? A Step by Step Guide to Decrypt Outlook Emails Encrypted in SMIME / OpenPGP Encryption. Remove Encryption from Outlook Emails to Save Protected Emails in PST, MSG, EML, HTML or Office 365. Check "Remove Encryption" option to decrypt SMIME / OpenPGP Encrypted emails in selected PST file. Checking Remove Encryption Option opens a new window "Add Encryption Details". Select the Key Type. Two options are available; Single Key and Multiple key. 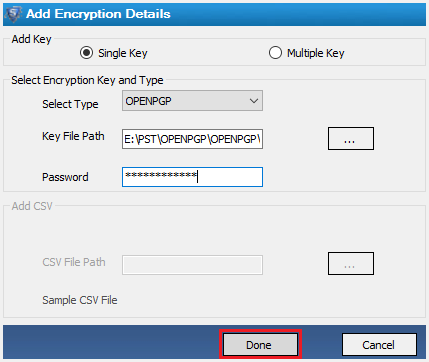 Now select Encryption Type and provide other essential details. Two Encryption options are available. For Single key Type, check Single Key option. 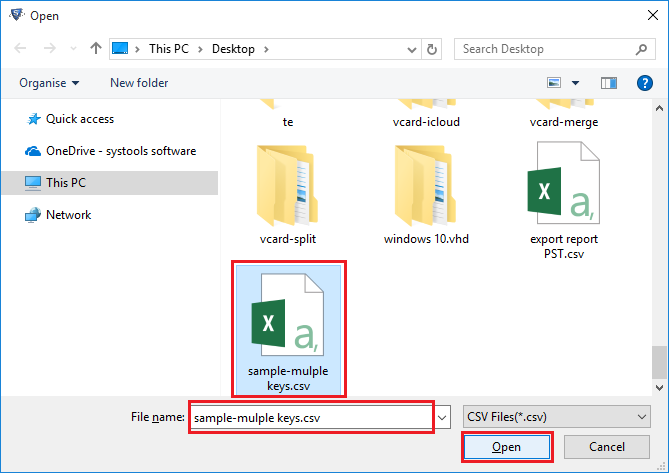 Note: Steps for Multiple Keys are described on Step No. 6. Select the Encryption Type "SMIME". Inserting the address location of Encryption Certificate file in respective textbox of "Key File Path". Click on the "..." button. Now, Browse the required Encryption Certificate, select it and click on "Open" button. The Path of the certificate selected will be displayed in the corresponding textbox to the "..." button. Enter the Password provided at the time of attaining Digital Signature (Certificates for Encryption) for emails in Outlook. For Multiple key Type, check Multiple Key option. 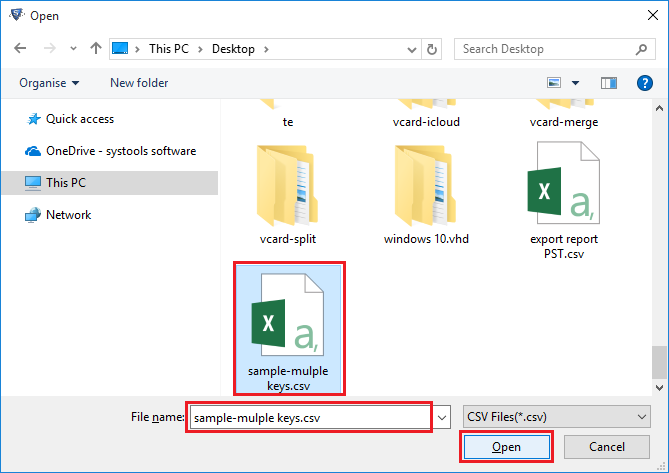 To provide Multiple Keys, press on Sample CSV File to generate sample .csv file. 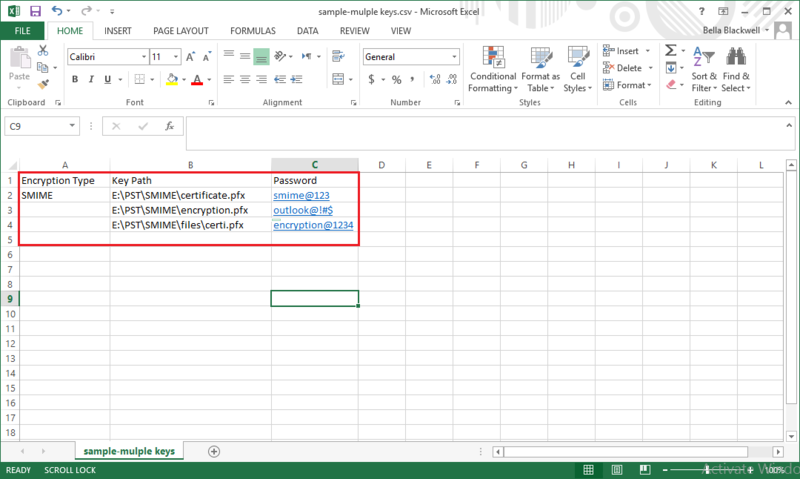 Edit the sample CSV file. Insert the address location of the certificate and its repective password in a row as shown below. 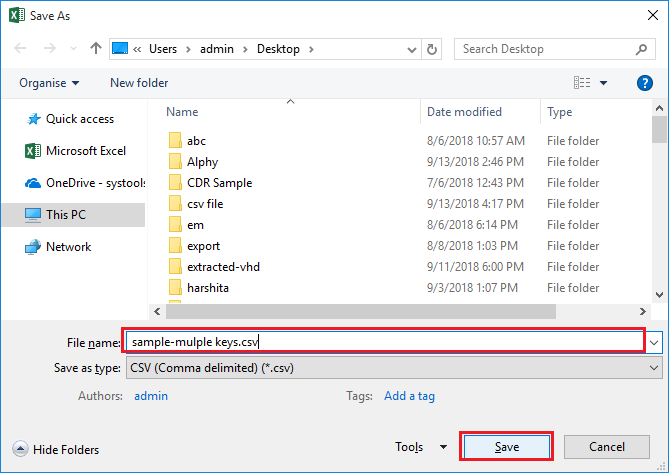 Save the sample CSV file in the desired location. 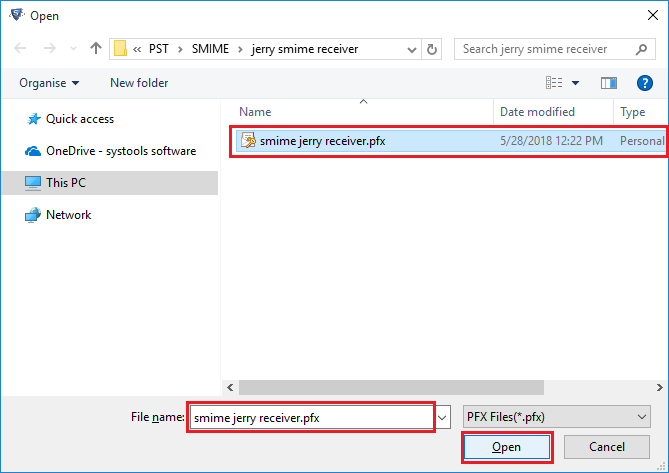 For chosing the saved file (in step no. 7) click on the "..." button. Now, Browse the CSV file, select it and click on "Open" button. Path of the selected file will displayed on textbox corresponding to "..." button. Press "Done". 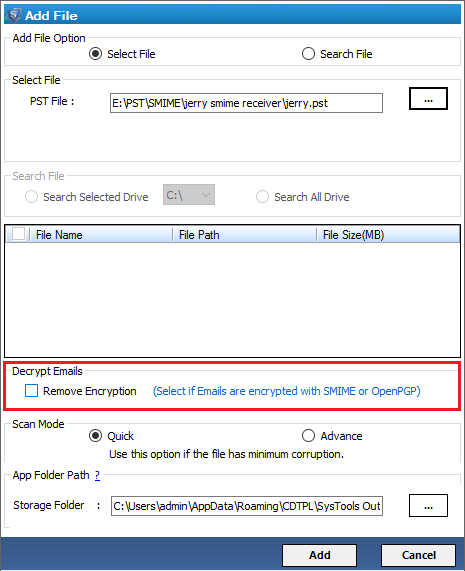 Completed the Procedure to Decrypt Outlook Emails encrypted in SMIME. You will be taken to the previous Windows. Continue the steps to Repair & Recover Outlook PST files. 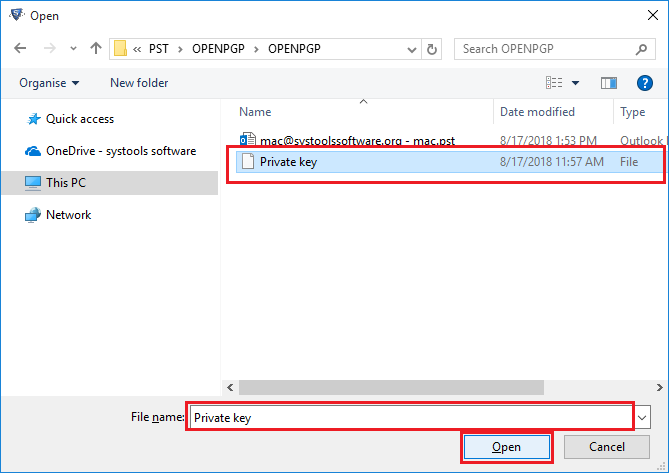 Inserting the address location of Private Key file in respective textbox of "Key File Path". Click on the "..." button. Now, Browse the required Private Key file, select it and click on "Open" button. The Path of the Private Key File selected will be displayed in the corresponding textbox to the "..." button. Enter the Password provided at the time of attaining Digital Signature (Private and Public Keys for Encryption) for emails in Outlook. Path of the selected file will displayed on textbox corresponding to "..." button. 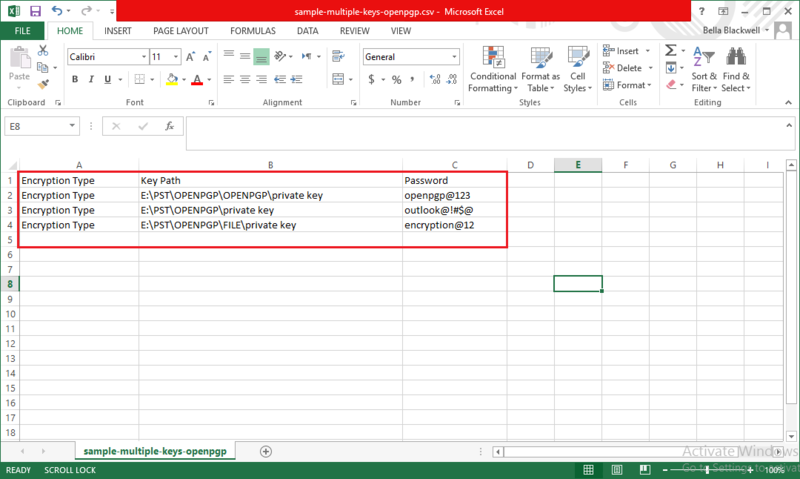 Completed the Procedure to Decrypt Outlook Emails encrypted in OpenPGP. You will be taken to the previous Windows. Continue the steps to Repair & Recover Outlook PST files.